How diverse are HRV? What maintains diversity or lack of diversity? The lack of broader diversity suggests all HRVs are in a stable status for maintaining selection for certain traits, yet still have mutational flexibility for escape from immune responses. Have we found most of the HRV out there? … the sequence space occupied by the available samples suggest that there may be many additional HRV-C strains awaiting discovery. Distance extrapolations relative to the new full reference cohort, predict the HRV-C may have an even broader range of serotypes than the original 99, of which each confers only limited immunologic cross-protection to another. Where do new HRV come from? Co-infection with multiple HRVs is known to occur, and we now know this can lead to unique strains that may have distinct biologic properties and clinical characteristics. Here’s the big picture (click for a larger version). Update: Vincent Racaniello of This Week in Virology and The Virology Blog notes in the comments that the ATCC sequences this paper relies on understate rhinovirus diversity, at least partly because an unknown number of rhinoviruses can’t be cultured for classical identification, and points out a paper from last year2 that identified other pathogenic human rhinovirus by a sequencing approach. 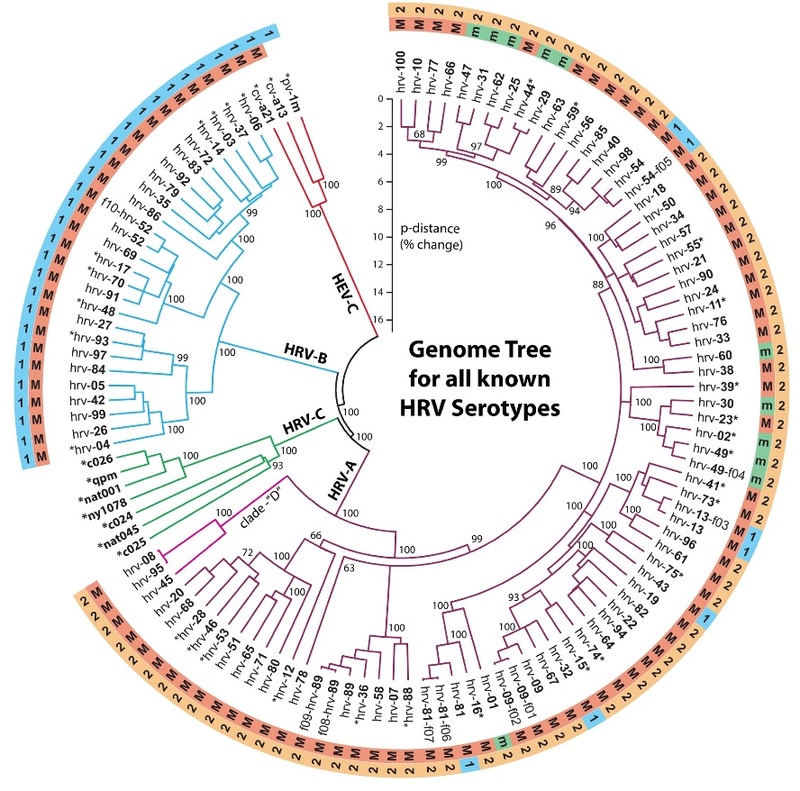 HRVs are even more diverse than the 99 serotypes sequenced in this work. 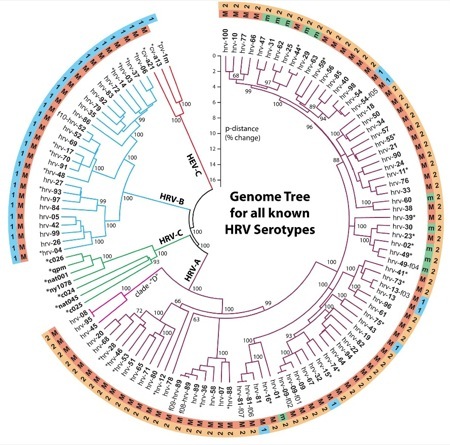 Don’t forget the newly discovered HRV clade, found by Lipkin and colleagues and also groups in Wisconsin and Switzerland: http://bit.ly/HuSZ. The key here is that these new HRVs were discovered by sequencing, not isolation in cell culture. Many of these HRVs don’t propagate well in conventional cell cultures. Therefore our estimates of HRV diversity are probably way off.